The inner city suburb of Kingston is well positioned to the east of capital hill and the Australian Parliament, as well as being just 4 kilometres from the Canberra city centre. It is an extremely leafy suburb with many tree-lined streets and plenty of parklands for residents to enjoy. There are lots of residental and serviced apartment buildings in Kingston, as well as affordable Kingston hotels with all of the facilities to make you feel right at home during your stay in Canberra. One of the best things about staying in Kingston is that it is in such a quiet location, but is still very close to many government department buildings, corporate offices, major tourist attractions and retail outlet stores. The newly redeveloped waterfront area of Kingston is a great place to visit during your stay, as are the restaurants, cafes, fashion boutiques and shops in Kingston itself and neighbouring Manuka. Other suburbs that surround Kingston include Barton, Narrabudah, Fyshwick, Griffith and Forrest. 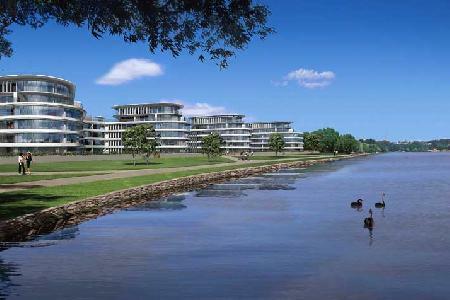 Because the suburb of Kingston is situated on the southern shores of Lake Burley Griffin it provides travellers with an excellent place to go for either a morning or evening stroll, relaxing bike ride and even a more energetic run. One of the main reasons why so many travellers to Canberra choose to stay at the Best Western Motel Monaro is because the central location places you within easy walking distance to the many boutique shops, cafes and restaurants in both Kingston and Manuka. Also staying at the Motel Monaro you will be close to businesses, government buildings, tourist attractions and the network of wlkaing and cycle paths around the picturesque Lake Burley Griffin. With a convenient location and a range of 1 & 2 bedroom self contained serviced apartments that are well equipped and fully self contained the Oxley Court Apartments is a great place to stay whilst visiting Canberra. These affordable apartments are only a few minutes from Parliament House, the Canberra city centre and the lake precinct, as well as being wlkaing distance to the Manuka and Kingston shops and cafe precinct. Ideally positioned in a quiet, tree lined street in the inner city suburb of Kingston the Pinnacle Apartments are a real home away from home that you will come back to again and again. Just a short w1lk from these quality serviced apartments will put you amoungst some of the fine restaurants, cosmopolitan cafes and boutique shops in Manuka, as well as the Parliament of Australia, Questecon Science Centre and the National Gallery of Australia. The boat harbour and waterfront precinct at Kingston is a new area that has been recently redeveloped into a modern area filled with quality apartments, boat mooring facilities, shops and food outlets. You will find it on Eastlake Parade and is conveniently located just a short walk from the majority of Kingston accommodation properties. If you are spending more than a day in Canberra then you should spend some time relaxing around the shores of the beautiful Lake Burley Griffin. You can either take a walk along the many walking trails, take a bike ride around the lake, go roller blading or have a picnic in one of the many parklands. The Parliament House is without a doubt the most popular tourist attractions in Canberra. It is prominently located on Capital Hill and is where the Australian parliament sits. You are able to take a free guided tour around this unique complex every day of the week. At the National Gallery of Australia you will find lots of amazing works of art from local and international artists. It is located on King Edward Terrace right next door to the High Court of Australia and also features a lovely sculpture garden which has lots of interesting pieces to admire. One of the most popular tourist attractions in Canberra for both adults and kids of all ages is the National Science and Technology Centre, which is also commonly known as Questecon. This attractions is situated on the southern banks of Lake Burley Griffin on the corner of King Edward Terrace and Mall Road West and is filled with plenty of interactive things for you to see and experience. If you have an interest in the legal aspect of Australian society then you should visit the High Court of Australia. It is located on King Edward Terrace on the southern banks of Lake Burley Griffin and within its walls you will discover all sorts of different information and facts about the Australian legal system and the laws of the country. Located just to the south east of capital hill and right next door to the suburb of Kingston is the Manuka Oval. This is Canberra's premier stadium that plays host to numerous AFL footy matches and major cricket matches throughout the course of the year. Canberra has some fine places to have a hit of golf including the Capital Golf Club. This 18 hole golf course is situated in the neighbouring suburb of Narrabundah and provides players of all standards with a challanging but relaxing course that is open to the general public. Travellers to Canberra will enjoy the delights of the Fyshwick Fresh Food Markets which is open from Thursday through to Sunday and is ideally positioned to the east of Kingston. At the Fyshwick market you will discover a large selection of fresh seafood, fruit and vegetables, meats, Asian groceries, delicatessens and cafes where you can enjoy a bite to eat. The main shopping precinct in Kingston is the local shopping area that is situated around Giles Street, Kennedy Street and Jardine Street. In this cosmopolitan shopping strip you will find a variety of different shops, cosmopolitan cafes, quality resturants, fashion boutiques and even a supermarket for your everyday needs. If you are interested in keeping fit or a looking for a great place to go for a walk or bike ride then the Telopea Park is a great place in which to do so. This extensive parklands is situated on the western side of Kingston on Telopea Road and includes walking and cysling tracks, a children's playground, picnic areas and plenty of car parking.